Planning to design personalised Christmas posters? Look for the plethora of Christmas images available for free and easy download. Generally, while designing the posters for Christmas, it’s to be noted that the content is not just restricted for the occasion, but also extends till the New Year as well. To celebrate the festive season and create classy posters, it is totally the designers’ prerogative to make the best out of the traditional concepts of Christmas icons like bells, reindeer, snow, Santa Claus etc, and make them look more attractive than the rest. 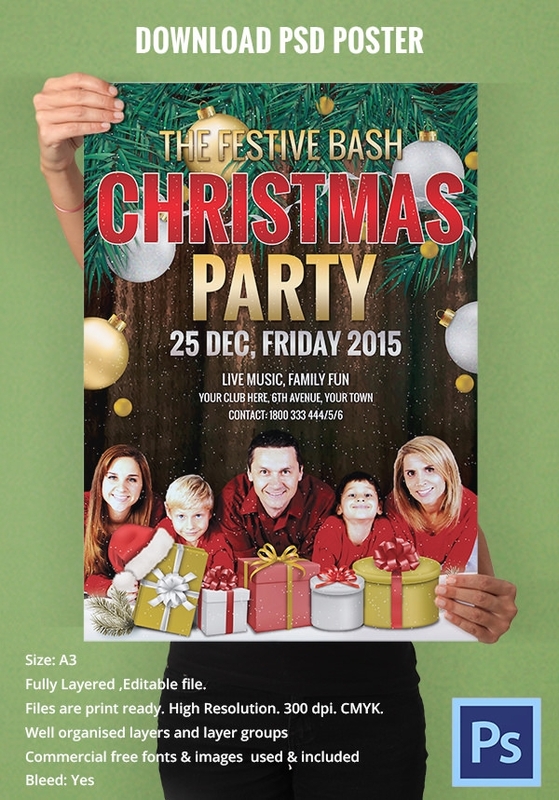 For those who are planning a family party and need a Christmas party poster design, then this is perfect. You can easily change up the information, images, text and so much more. Holiday parties are always fun to plan, especially the posters. This A3 size template is simple, yet elegant and you can easily customize all aspects of if, including color, font and more. If you want something that will stun all of your friends, then this template is great. It is fully editable and A3 in size and you can change up the images, text, font and more. 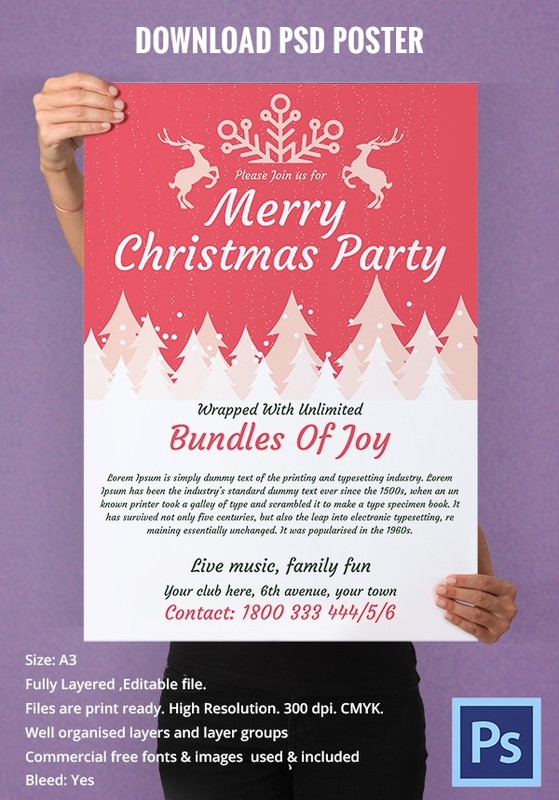 This is a great Christmas party poster design that you can easily customize everything, including the images, fonts and more. It has plenty of great holiday designs, including Santa, presents and more. The design trends seem to change every year albeit using the same design elements. 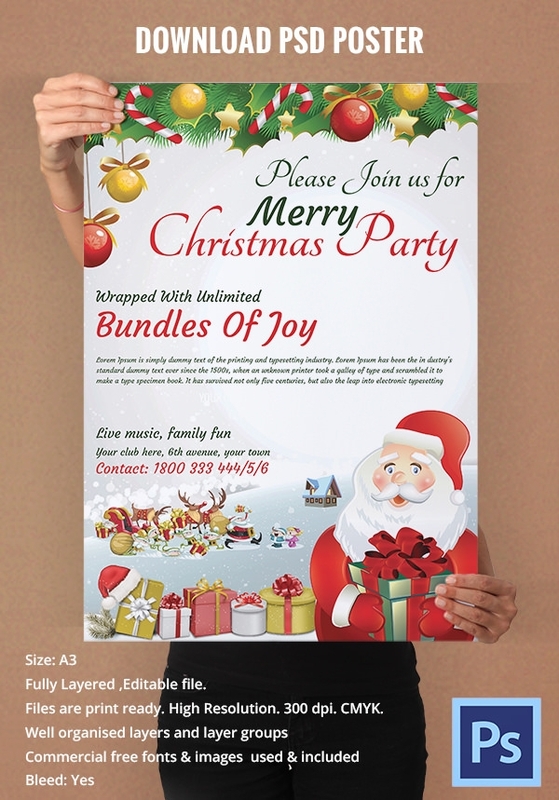 Christmas posters are generally used for commercial projects which aim to ignite the festive mood among the shoppers or the visitors. This is why the choice of colours, gradient, drop-shadow, and pixel count matters a lot to make the printed version look equally magnificent as the digital version. 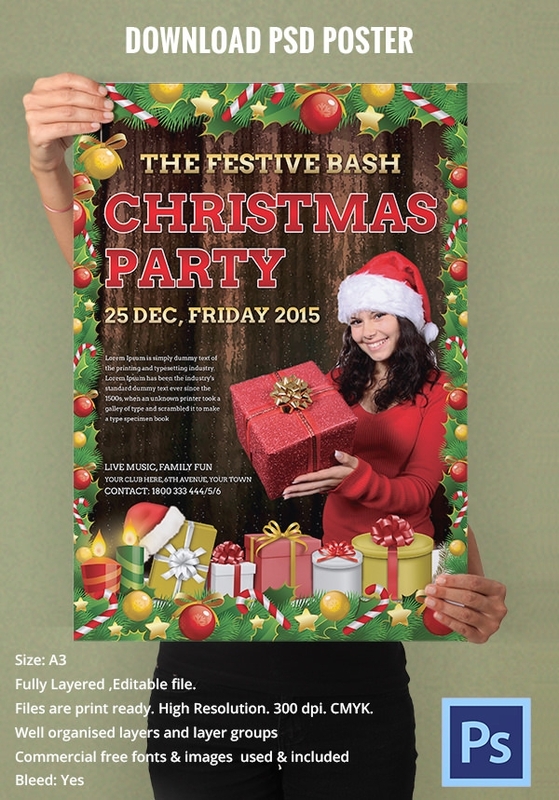 The party posters and the flyer templates can be created with the PSD files, vector images, and stock images coming to you in all popular formats like JPG or PNG. No matter whatever be the appetite of the client for the designs, do not forget to explore the complete range of colour options. Decorated Christmas trees, chubby little Santa, fluffy snowflakes are possibly the most common icons that can be used for the posters. To make it more personalised, use the tag lines or simple words, sending messages and good wishes. Use the vector stamps, line-styled Photoshop brushes, flat-styled vector templates, gradient and shadow free Christmas themed characters, etc. to make your poster rich in colours and design expressions.